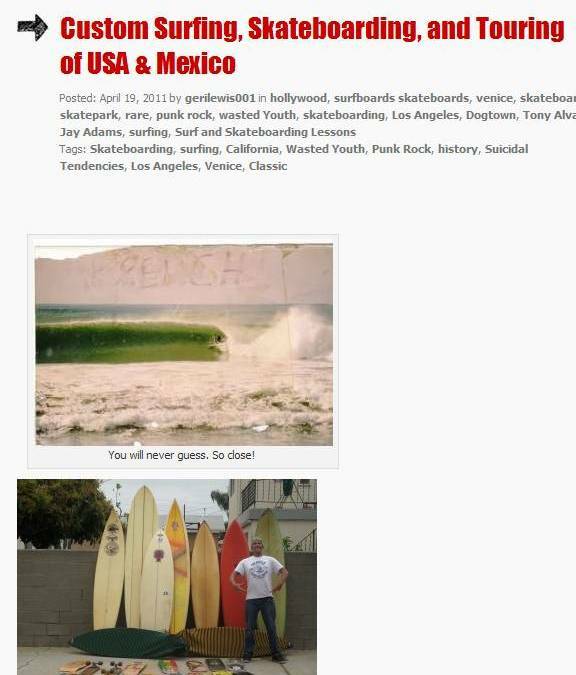 Ger-I Lewis is Venice’s skate park coordinator and executive director of the Venice Surf and Skateboard Association. The VSA goal is to promote surfing and provide an alternative to the gang warfare that had claimed many young lives on the streets of Venice. Ger-I Lewis and Jesse Martinez are the two people responsible for making the park happen after ten hard years of work and Venice will forever be indebted to them for their selfless effort. Ger-I Lewis is also the author of “1978: Crashed Memories”. 1978 is the true story of a young gun’s induction into the world of L.A's exploding Punk Rock scene. In this book delivered with a street honed panache that only hard won experience provides, Ger-I Lewis takes the reader on an epic journey through L.A's underbelly. From his rough and tumble roots in Dogtown (Venice,CA) to the not so glitz of Hollywood, Lewis takes the reader on a rollercoaster tour of adolescent exploration and discovery. Accompany Lewis as he takes you surfing and skateboarding with the Dogtown crew, details the origins of Suicidal Tendencies and holds no punches as 1978 shatters urban myths and mass misconceptions. Finally just as you are reeling from a flurry of action, Lewis delivers the knockout blow, revealing the real deal concerning Darby Crash, his life and untimely death.